Eyeball Boxing pits players in the ring as a group of scrappy, eyeball characters. Eyeball Boxing is a romping great time. "Fast paced, easy to learn, 'eyeball boxing' is as fun as it is absurd." "I've always wanted to take my family into the ring. This was awesome!" Visit here to watch the Eyeball Boxing How-to-Play video. Put your dukes up and pass the mustard. There are two things in the world that matter to every eyeball: one is boxing; the other is making hotdogs. In the arena, all eyes are equal, hazel, green, brown, or even black and blue. But by either punching the lights out of the rest or building the perfect hotdog, only one eye can take home the prize. Eyeball Boxing pits players in the ring as a group of scrappy, eyeball characters. Fists fly in a toe-to-toe punch-out brawl. But eyeball boxing has never been more dangerous; with illegal moves like hot sauce in the eye and stinging insect swarms, there is no telling who will be the last eye standing. This fast card game for 2 to 5 players is a perfect family game. With short games, it becomes easy to play several games in one night. 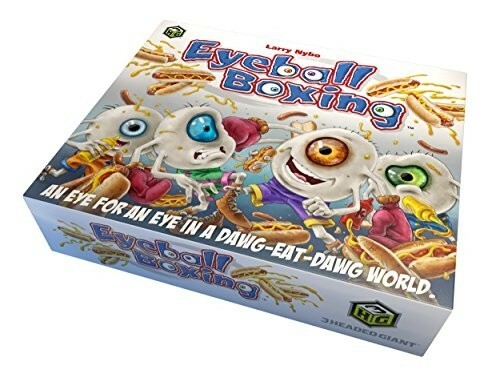 Eyeball Boxing has just enough strategy to keep it interesting and isn't too complicated, making for a perfect social night of game playing.